Katia Légeret-Manochhaya is a Professor of Aesthetics and Art Theory in the Department of Theatre at Paris 8 University, France and Director of the Laboratory of researches on Aesthetics, Sciences and Technologies of the Arts. An enthusiast of Indian culture and traditions, Katia writes about the Indian classical dances with emphasis on Bharatanatyam. Katia Légeret-Manochhaya’s main field of research comprises the twentieth-century European playwrights, stage directors and choreographers inspired by Asian performing arts, specifically from India. Katia, a professionally trained Bharatanatyam dancer had the start of her international career in Chennai with Swarnamukhi, a Tamil Nadu based artist and, since 1986, she interprets Natyacharya K. Muralidhar Rao’s repertories (Karnataka, Pandanallur style). “Shiva-Rodin” (2013) and “Panchatantra/La Fontaine” (2010-2015) are among her stage creations with her company. Amidst celebrations of the ongoing “Bonjour India” events, marking the Indo-French ties at the ongoing Kolkata Lit Fest (KLF), Katia visited Kolkata to deliver a lecture on her book Rodin and the Dance of Shiva. How did your connections with India begin? 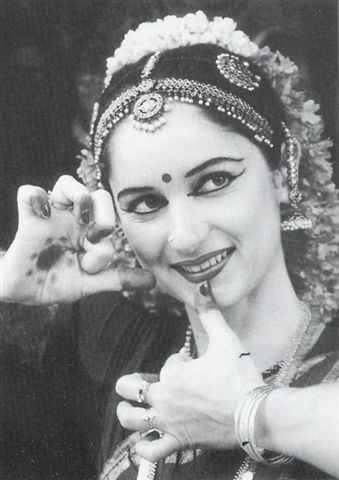 For 40 years, I have been learning, practicing and performing Bharatanatyam, which I prefer to refer to as dance theatre. I chose Bharatanatyam as it appealed to me and is one of the most popular classical Indian dances globally. I started to learn in Paris, and then moved to Chennai to learn, then trained a while in Mysore and started penning articles and books on the same. What aspects of Bharatnatyam appealed to you? I have chosen Bharatanatyam for two main reasons. The first being, in this discipline, different forms of artwork together. It is dance with theatrical elements and at the same time, its theatre set to a pattern of rhythmic movements. The second reason being that Bharatanatyam has been reconstructed in 1932 at Chennai in Music Academy; this implies that it’s both rooted in traditional text and practices but it’s also an open spirit to creativity in the contemporary world. Now, the theme for the performances is discussing social issues, which incorporates issues like women’s rights. I like this creative fusion between heritage and future of the society from which the dialogue and ideas for the dance is constructed. What acts as the core philosophy behind your staged performances? To me, it is important to highlight this harmony between traditions and prevalent issues that are dictating the present performances thus adding a contemporary touch to a classical dance such as Bharatanatyam. I believe that the line of strict grammar between what classifies as classical dance and as contemporary dance should be gradually discouraged. Modern dance and theatrics in India and in various European countries are coming out of a new emerging culture and aesthetics that classifies as contemporary with the gestures and/ or discipline of traditional dance forms. As such, have you noticed any cultural congruency between India and Europe? My research body is to study the influences of Indian art in European stage directors and choreographers and thus, in that one can find similarities in terms of influences. But I would say it is the diversity that connects the two cultures. For instance, dance is universal. We can communicate by body languages but I feel even in India, several do not understand the meaning of the different gestures or implications of hasta-mudras (hand gestures) in dance but the culture helps them interpret it in their own ways. There are some things which we cannot translate because it belongs to poetry. If art is connected to poetry, then its subject’s interpretation belongs to the creativity of spectators and artists and this dialogue must work together. In this, countries across the globe are similar in their difference in perceptions and different in their similarity of perceptions based on a unifying cultural background. What is the idea behind your book Rodin and the Dance of Shiva? My book essentially describes the work of François Auguste René Rodin, a renowned French sculptor, who was so inspired by some photographs of the 11th-century bronze Shiva Nataraja in the Madras Museum around 1915 that he wrote that it seemed to him the “perfect expression of rhythmic movement in the world.” His text, “The Dance of Shiva” was an ode to the sculpture, heralded as one of the most important sculptures of South Asia. Written at the end of his life, this vision of The Cosmic Dancer, “Lord of actor-dancers”, revealed the underlying links between Rodin’s dance sculptures (1910), Indian sculpture and Dance-Theatre as Bharatanatyam style. Through his text, Rodin invites us not only to a new reading of his work but also opens the door to the new connections that he suggests between sculpture, poetry, dance, theatre, music, photography and architecture. My aim was to bring forward these connections with my own critical reading into the text. Thank you Shalini Dasgupta, I like very much your interview !